In the latest from the author of A Familiar Tail,a witch and her familiar find trouble brewing at a coffee house. After discovering her mystical heritage—and being adopted by furry feline familiar Alistair—artist Annabelle Britton has decided to make picturesque Portsmouth, New Hampshire, her new home. Now, she can take the time to figure out her new abilities and welcome her grandmother, who is visiting Portsmouth, and her old coven, for the first time in thirty years. 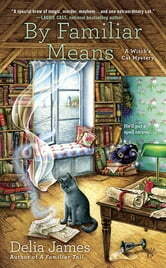 A quirky mystery with a cat sidekick. There is a goodly amount of humour with another twist ending. This is a wonderful story. I couln"t put it down.it was tantilising,will the next page, the next chapter hold another clue. I LOVED THIS BOOK. The only disappointment was that it had to end. Looking forward to the next one.